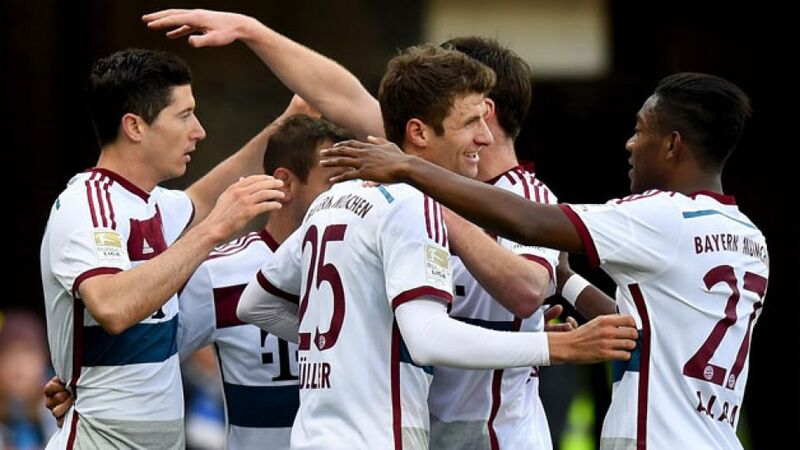 Paderborn - There was no sign of a European hangover for FC Bayern München on Saturday as the league leaders triumphed 6-0 away to promoted side SC Paderborn 07. A first-half Robert Lewandowski brace set the Bavarians up for a comfortable second period, in which an Arjen Robben double and goals from Franck Ribery and Mitchell Weiser added an extra gloss to the scoreline. There was no room for fan favourites Mario Götze or Bastian Schweinsteiger in Pep Guardiola’s starting line-up at the Benteler Arena, but their absences were not felt by Bayern, who, as is now customary, immediately asserted their authority on the game. The visitors kept the ball well in the Paderborn half and probed for openings, but the deep-lying hosts afforded them little room to manouevre. In fact, the first side to draw a ripple of approval from the crowd was Paderborn, when Alban Meha fired a swerving long-range effort just wide of Manuel Neuer’s goal. Paderborn defended bravely for the first 20 minutes or so, but, perhaps inevitably, Bayern’s pressure took its toll eventually. It was an exquisite opening goal too, with Robben’s superb first-time flick over the home defence allowing Lewandowski to slot the ball past Lukas Kruse for his ninth goal of the season. The Polish striker doubled the visitors’ lead shortly before half-time with a well-taken poacher’s finish. Thomas Müller’s wayward shot was not properly cleared by the hosts, who seemed to switch off, allowing Ribery to keep the ball alive on the left and cross to Lewandowski, who flicked in at the near-post. It was the 26-year-old’s 84th Bundesliga goal, moving him into the top ten of the league’s all-time highest-scoring foreigners. After the restart the hosts were initially more adventurous going forward and very nearly caught Bayern off guard twice. First, Meha’s unexpected slide-rule pass from a free-mark found Elias Kachunga unmarked in the penalty box, only for his first touch to let him down. Meha then attempted an audacious 50-yard lob after spying Neuer off his line, but the Albanian’s effort sailed narrowly over. Padeborn’s already slim hopes of a comeback were effectively extinguished in the 62nd minute when defender Florian Hartherz was sent off for fouling Robben in the penalty area when he looked certain to score. The Dutchman made no mistake from the ensuing spot-kick, meaning he has now hit the net against all of the other current 17 Bundesliga sides. With the result all but guaranteed, Paderborn let their heads hang in the closing stages and were duly punished. Ribery rifled in from 15 yards after collecting an unsuccessful headed clearance and substitute Weiser also got his name on the scoresheet - his maiden Bundesliga goal - with a superb lob over home keeper Kruse. Robben capped off a comfortable afternoon’s work for the defending champions with a close-range finish following excellent work from Ribery.